Examining Darwin On His 200th Anniversary The work of Charles Darwin, who was born 200 years ago Thursday, transformed our understanding of life on Earth and underpins the whole of modern biology. His work challenged just about everything the Victorians believed in. The work of Charles Darwin, who was born 200 years ago Thursday, transformed our understanding of life on Earth and underpins the whole of modern biology. His work challenged just about everything the Victorians believed in. Today, around the world, people are celebrating the 200th birthday of Charles Darwin. His theory of evolution by natural selection fundamentally reshaped our understanding of how life evolved on this planet. NPR's Joe Palca has just returned from reporting trips to England and Kansas, as part of NPR's coverage of the Darwin bicentennial. Joe, welcome back. JOE PALCA: It's great to be here. BLOCK: Before Charles Darwin comes on the scene, had anybody been writing or thinking about evolution? PALCA: Well yeah, they had, and it's fair to say that people knew that species changed somehow. I mean, the prevailing thought was that all species were sort of put here by a creator, and they were here for a certain amount of time, and then they went away, but that was all set in stone. And people began to think, well, maybe there's some wiggle room about that. Maybe nature does have some role. But nobody had figured out the mechanism, and it was natural selection - this idea that over millions of years, nature could favor varieties that were more successful. That was Darwin's insight. BLOCK: And, 150 years since the publication of "On the Origin of Species" -what was the original reaction to it when it came out? PALCA: Like any new idea, there was reluctance - not just theologically but from the scientific community. There were people who said, oh, this can't be. But pretty quickly, Darwin won over the scientific community. And what's been interesting is in the 150 years since the publication - I mean, he published when the gene was not even a concept in his world - and since then, molecular genetics, molecular biology, has actually found the mechanism for the things he was proposing 150 years ago. See, he was more right than he actually knew at the time. BLOCK: We mentioned that you're just back from England. Are there big Darwin-doings over there? PALCA: Oh my goodness, it's Darwin, Darwin, Darwin. There are stamps. There are coins. There are lecture series, BBC programs. My favorite, which I confess, is a knitting group, which is knitting something in honor of evolution, and quilters who are making a quilt of tapestry of the voyage of the Beagle. So, I mean, they're definitely into this over there. BLOCK: Why not? Why not quilting? You also went, we mentioned, to Kansas to cover the Darwin bicentennial. Why Kansas? BLOCK: How's that going, Joe? PALCA: Slowly. But there are three copies in the Kansas City area. And I thought maybe there's some there. I thought it was kind of interesting because, you know, Kansas has sort of had a reputation as being a place that's been a little less comfortable with the notion of evolution. There have been fights about teaching evolution or this alternative, which is creation science of a sort, called intelligent design. Anyway, there's been fights about this, and I thought well, is there a copy in Kansas? And sure enough, there is. And I think what you see is that institutions of higher learning, universities, have embraced Darwin almost 100 percent. And it's a social discomfort - not a scientific, not an educational discomfort - with Darwin that I think, really, was playing out. So, I went there to sort of look into that a bit. 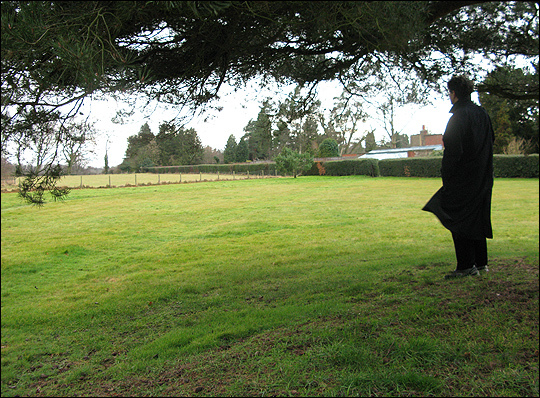 Alun Anderson looks over the field at Down House where Darwin conducted his earthworm experiments. By doing experiments in his yard, Darwin proved that earthworms were turning the soil and making it more fertile. This was a surprising finding to 19th-century gardeners, who thought the worms were pests. Joe Palca speaks with science journalist Alun Anderson about why he dug up Darwin's garden. 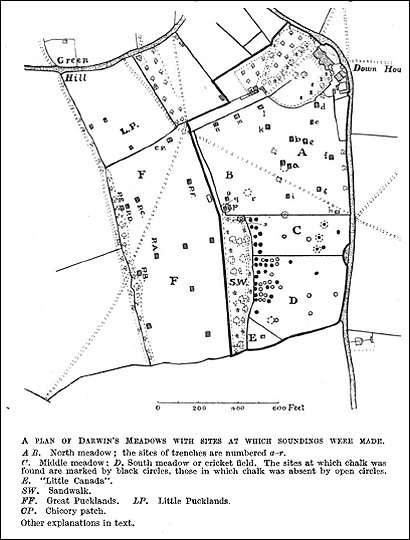 This 1942 map shows where Darwin dug trenches and laid down stones in order to test if earthworms were aerating the soil. Many people know about Darwin's famous voyage aboard the Beagle — of his observations of the birds on the Galapagos Islands. Less well known is that Darwin spent quite a bit of time studying earthworms. Initially, his earthworm work drew as much, or more, attention as his evolution work. His book, The Formation of Vegetable Mould Through the Action of Worms, With Observations on Their Habits, published in 1881, sold even better than On the Origin of Species during Darwin's lifetime. Darwin began his observations on earthworms as a young man, but abandoned them to fiddle around with revolutionizing biology. It was only late in life that he returned to his worm pursuits. 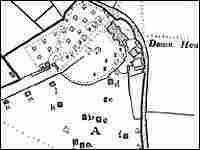 He did most of research at Down House, his country estate outside London. "At the time when Darwin started looking at the worms, no one appreciated the role they had in agriculture," says Alun Anderson, a journalist who became interested in Darwin's worm work. In fact, Anderson says, in the mid 19th century, most people thought earthworms were pests. But Darwin was convinced they were valuable for turning over the soil, in part by chewing it up and pooping it out, thereby making it more fertile. To find out how fast the worms were turning the soil, Darwin did experiments. 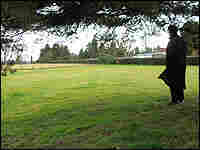 He spread small coal stones across a field behind his house and left them for 20 or 30 years. Then, he dug a trench across the land and looked in the walls of the trench to see how far down the stones had sunk through the action of the worms. It's true that Darwin's earthworm work probably is not as important as his work on natural selection. But it does provide an insight into his genius. "Only Darwin would go out there and start to do experiments and start to come up with a whole theory as to what earthworms did and why they were beneficial," says Anderson. "Everyone else just took them as part of life and didn't think hard like he did."